The 2015 Kia Optima family sedan shines with a dazzling array of features and options that elude even some premium luxury brands. 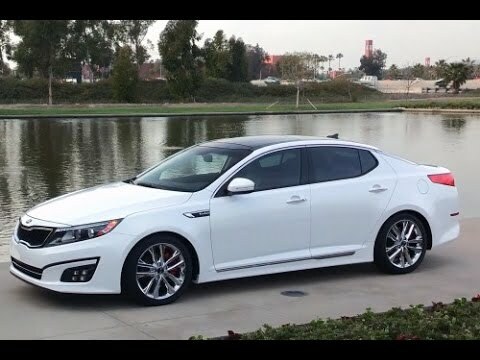 The Optima pampers its occupants, is easy on fuel and, with the available turbocharger under the hood, goes like nobody's business and does it all for less than $30,000. I have a sharp looking car that makes a sultry statement because of the color. I have a smoky blue black Kia optima lx it's a fine looking car it drives and rides well the traction is good my problem is i didn't get the chrome on bottom of outside door its rubber at bottom of widows which looks dull from the weather just came to me I could put armor on the rubbers ok. The gas mileage is not good at all I think 28 or less it takes at least 40 plus to fill up. I should have gotten leather seats, a backup mirror as well but I have had no mechanic problem it is comfortable and performs well very reliable. Watch the little antenna thing on the roof when going through car wash have them tape it down or it might come off. This car is also a push to start. There are no problems I have had with my car since I have purchased it. The performance on the car is great, I get 30 plus miles to the gallon which is great for me because I do a lot of driving. The car is very reliable, it never breaks down on me or anything. The Kia optima is a very comfortable car to be in, it is features include, leather seats, a screen, buttons on the steering wheel. This car is overall a great car and I would recommend it to anyone looking for an affordable, cute, spacious car with great gas mileage. The car is very nice looking on the outside as well. Never deal with a "buy here pay here" because it is a nightmare. I bought this car from a "buy here pay here" and it was wrecked on the rear driver's side but it drove wonderfully. I went into the contract getting paid every two weeks and then it changed to twice a month on the 15th and the 30th. They would not work with me as far as me making payments. They wanted their payment on the 2nd which wasn't going to happen due to rent being due. I explained to them I could pay it on the 15th and they wouldn't budge. I ended up having to give the car back so now I am careless with 2 grandbabies.